ILO E. THOMPSON, age 97, of Greenfield, formerly of New Martinsburg, went home to be with her Lord on Saturday, March 16, 2019 at 10:46 p.m. at the Edgewood Manor of Greenfield. She was born on March 29, 1921 in Shelby County to Carl and Tillie Steele Wildermuth. 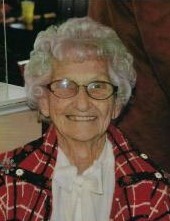 She was a 1938 graduate of Jeffersonville High School. Ilo was a homemaker and had been very active as a Sunday School teacher in Centerfield and New Martinsburg. She had attended the Church of Christ in Greenfield. Ilo was preceded in death by her husband, Jack Thompson, whom she married on July 5, 1939 and he later passed on October 17, 2003, brother, Lowell Wildermuth, sister, Esther, and her husband, Carl Max Wagner, and her daughter-in-law, Carolyn Thompson. Survivors include her children, Jack L. Thompson of Washington CH, and her daughter, Judy A. McCarty of Greenfield; grandchildren, Parrish A. Conaway and Cherish McCarty both of Greenfield, Jill (David) Crandall of Michigan, Jan (Bill) Roop of West Virginia, and Joan Thompson (Doug) Sergent of Virginia; great-grandchildren, Tiphany Sanderson, Destiny Vickers, Lauren Crandall, Isaac and Isabell Roop, Riley and Trinity Butcher; great-great-grandchildren, Eli, Lili, and Wyatt as well as her sister-in-law, Virginia Wildermuth. The funeral service will be held on Wednesday, March 20, 2019 at 11:30 a.m. at the Summers Funeral Home with Danny Dodds officiating with burial to follow at the Milledgeville-Plymouth Cemetery. Family and friends may visit at the funeral home on Wednesday morning from 10:00 a.m. until the time of the service.